The first thing I noticed about this book was that it has no byline. 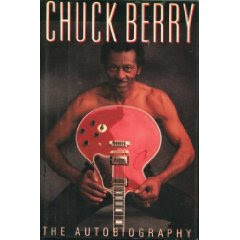 It is simply titled "Chuck Berry The Autobiography." And it is clear that this is no ghost written volume of anecdotes. This is the real thing, written by Chuck Berry himself. With his unmistakeable style of writing he takes you from the St. Louis of his youth to his dark years of confinement in a juvenile facility. After his release he returns home, working for his Dad while learning the guitar. From there he begins to play around St. Louis, establishing a local following. His relationship with Johnnie Johnson, a local paino player with a trio of his own, and how it becomes The Chuck Berry Trio is an insight into the attitudes and the people of the era. An impromptu trip to Chicago and an encounter with Muddy Waters (nee McKinley Morganfield) lead him to the Chess Records Studio. From there we share his amazement and wonder of touring in places like New Yorks' Paramount Theater and the Alan Freed Shows. Learning the business along the way was not always easy and he gets cheated along with all the rest of the pioneers of Rock and Roll.But he keeps rocking and rolling, establishing himself as one of the Fathers of the Genre. You meet,along the way, such luminaries as Howling Wolf, Ike Turner and Little Richard to name just a few. He describes their struggles as well as his own, learning the business the hard way in an industry controlled by whites. The writing itself is often laced with internal rhyming and interesting word plays that evoke the lyrics of Chuck Berry's hits. The man is a lyrical treasure chest and sees everything as if it were a song waiting to be written. He very casually explores and explains how some of his earlier records were written. He describes in detail the interactions of learning to play in different clubs to different audiences and makes you want to grab a guitar and hit the road. Never a shrinking violet, Mr. Berry talks freely of his fascination,and interaction with white women at a time when such things could be deadly. Think Emmitt Till in the summer of 1954- the very year that Chuck hits the road. The inner workings of early rock and roll are explored through the Alan Freed "payola" trials. Mr. Berry carefully explains some of the sinister practices that robbed our early rock pioneers of money and pride. He does it without bitterness or rancor- this was just the way things were then. The Chapter on his problems with the IRS in the early 70's is of interest. The way he accepts the penalty and reports to Lompoc Prison in California are also another insight into the character of this legend. Of course this book only goes up to 1986- the year before Keith Richards of The Rolling Stones would make a landmark film with Chuck Berry and Johnnie Johnson(who was working as a bus driver at the time)called "Hail. Hail Rock and Roll." This book cries out for a sequel from a man who really took music a step further toward the Rock and Roll we all know and love. A music that came to define a nation, if not a whole generation. Hail, Hail Rock and Roll!